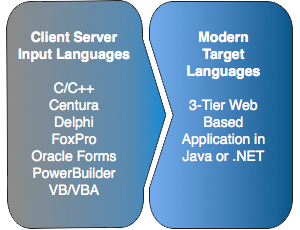 The Metex application modernization process uses a sophisticated set of automated tools and professional services to transform client server applications into modern 3-tier web-enabled Java or .NET architectures. 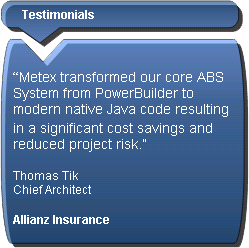 Allianz Insurance successfully transforms insurance system from PowerBuilder to Java using the Metex Modernization Solution. The Bank of Montreal successfully converts critical risk assessment application from Visual Basic 6 to .NET using Metex modernization services. The Texas Computer Cooperative / ESC-20 successfully migrates Student Administration System from PowerBuilder to Java using Metex Modernization Services. MortgageFlex successfully migrates its flagship LoanQuest mortgage and loan origination system from Centura to .Net using the Metex Modernization Solution. As the leader of client server modernization solutions, Metex utilizes automated tools, expertise and domain knowledge for the successful modernization of its customers’ legacy client server applications and databases. The Metex modernization processes and technologies have been developed and refined over the previous 14 years and validated on over 100 million lines of legacy application source code. Metex unique combination of a suite of automated tools and specialized professional services minimizes project risk while offering code quality comparable to a manual re-write, at a faster speed and more favourable cost.